The recession coupled with job uncertainty for many is causing a downturn in the exercise industry. Reuters reports that a recent sporting goods industry survey has found fathers across the country are downsizing their exercise budgets, according to MSNBC.com. So how can you stay fit without breaking your budget? Consider giving up your expensive gym membership in exchange for a more frugal option. Check to see if there’s a YMCA or other community-based fitness facility available near you. These can save you a lot of money without compromising on equipment, facilities or classes in many cases. Check to see if your employer or health plan offers a discounted gym membership near you. Some companies are able to make deals with local health clubs to save their employees money. Many health insurers will reimburse you for fitness costs as well. They know the importance of exercise for optimum health. If you simply don’t have the time or money to join a gym, consider investing in some basic exercise equipment to keep active. A pedometer can help you measure your steps and see how much you’re walking every day. 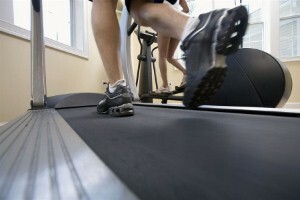 Gerald Endress, Fitness Manager for Duke University’s Diet & Fitness Center tells ABCnews.com that individuals should aim for 10,000 steps a day, which is about four miles. If you’re falling short of this number, the pedometer will help you make a conscious effort to increase your walking activity. Myatt Murphy, author of The Ultimate Dumbbell Guide, tells Reuters that free weights, hand weights and dumbbells are a great choice when considering a budget. "There were thousands of exercises you can create using one pair of dumbbells. And if you’re on a budget, that equals pennies per exercise at most," he said. Finally, remember that staying fit isn’t just about setting time aside to exercise. You can increase your heart rate and work up a sweat doing everything from raking leaves to vacuuming the house. Playing with your kids is great exercise as well, just aim for 30 minutes a day.